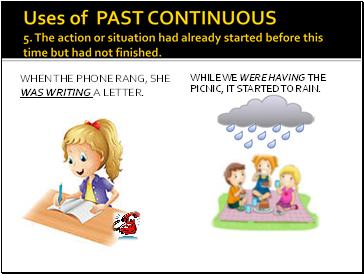 Uses of PAST CONTINUOUS 2.two actions happening at the same time in the past. wHile she wAs preraring dinner, he was washing the dishes. 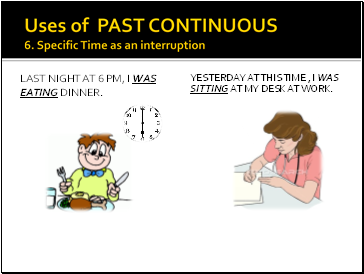 Uses of PAST CONTINUOUS 3. action going on at a certain time in the past. 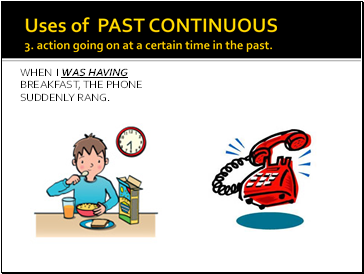 Uses of PAST CONTINUOUS 5. The action or situation had already started before this time but had not finished. Yesterday at this time , I was sitting at my desk at work. When I walked into the office, several people were busily typing, some were talking on the phone, the boss was yelling, and customers were waiting to be helped. 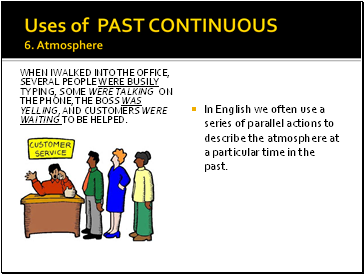 In English we often use a series of parallel actions to describe the atmosphere at a particular time in the past. he was always coming late to class. 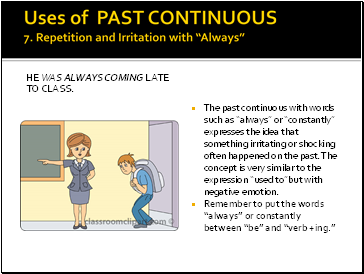 The past continuous with words such as “always” or “constantly” expresses the idea that something irritating or shocking often happened on the past. The concept is very similar to the expression “used to”but with negative emotion. I don’t like them because they were always complaining. Clauses are groups of words which have meaning, but are often not complete sentences. Some clauses begin with the word “when” such as “when she called” when it bit me”. 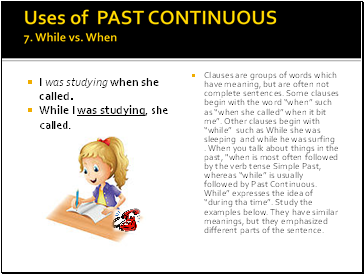 Other clauses begin with “while” such as While she was sleeping and while he was surfing . 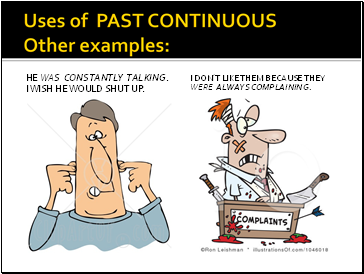 When you talk about things in the past, "when is most often followed by the verb tense Simple Past, whereas “while” is usually followed by Past Continuous. While” expresses the idea of “during tha time”. Study the examples below. They have similar meanings, but they emphasized different parts of the sentence.